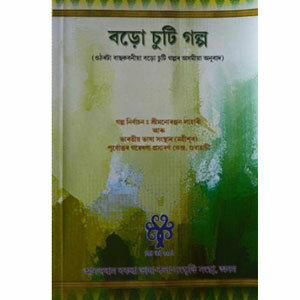 This is an anthology of eighteen short stories selected from the Bodo language by Manoranjan Lahari and CIIL and translated into Assamese by the Late Madhuram Boro, Sri Ratneswar Basumatary, Sri Mangal Sing Hazowary, Sri Bhupen Narzary and Smt Anjali Daimari. This book includes the bodo stories of the Late Ishan Chandra Moshahary, Musri Prasenjit Bramha, Musri Siken Bramha, the Late Bishnu Prasad Rabha, Musri Manoranjan Lahari, Musri Jagadish Ch. Bramha, Musri Nikamal Bramha, Musri Ranjit Kr. Borgoyari, Musri Haribhushan Bramha, Musri Mangalsing Hazowary and late Bireswar Basumatary.